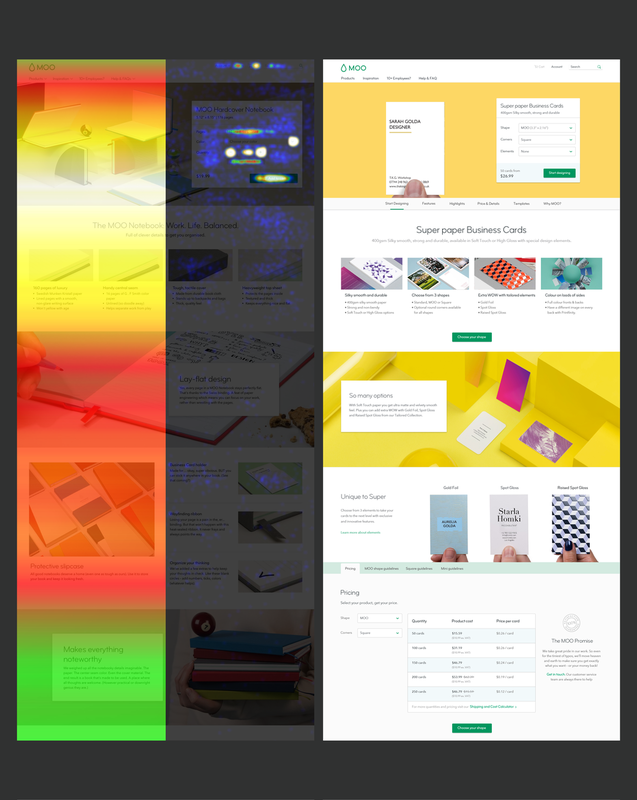 The proposed migrated homepage redesign (see below, top left) was performing badly in comparison to the version it aimed to replace, reductions in click throughs, higher bounce rates were observed. We used click map data from the previous version (bottom left) as a basis to design a new variant (right) which more closely matched the previous versions more effective content strategy, simpler more easily skimmable grouping and highly visible links to major products. 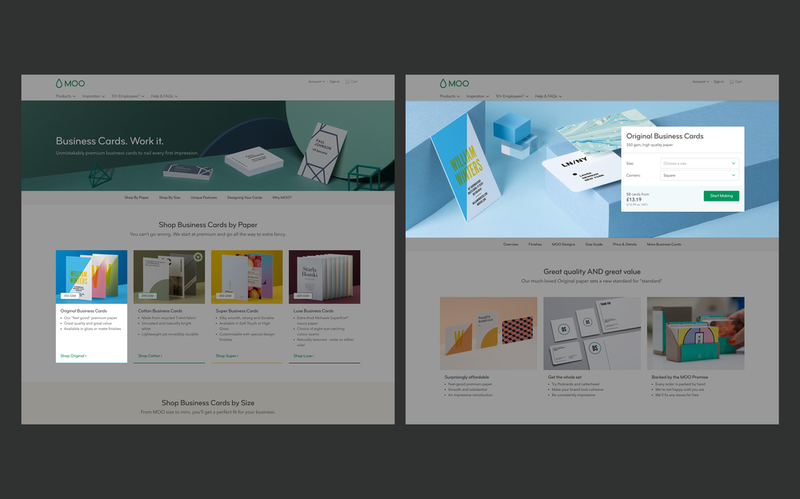 With the task of migrating four of the most important pages on MOO.com, the business card 'paper' pages (Original, Cotton, Super and Luxe) the risk averse business owners were keen to retain the existing structure and content strategy (left). As this approach was assumed low risk and shouldn't negatively affect KPIs. 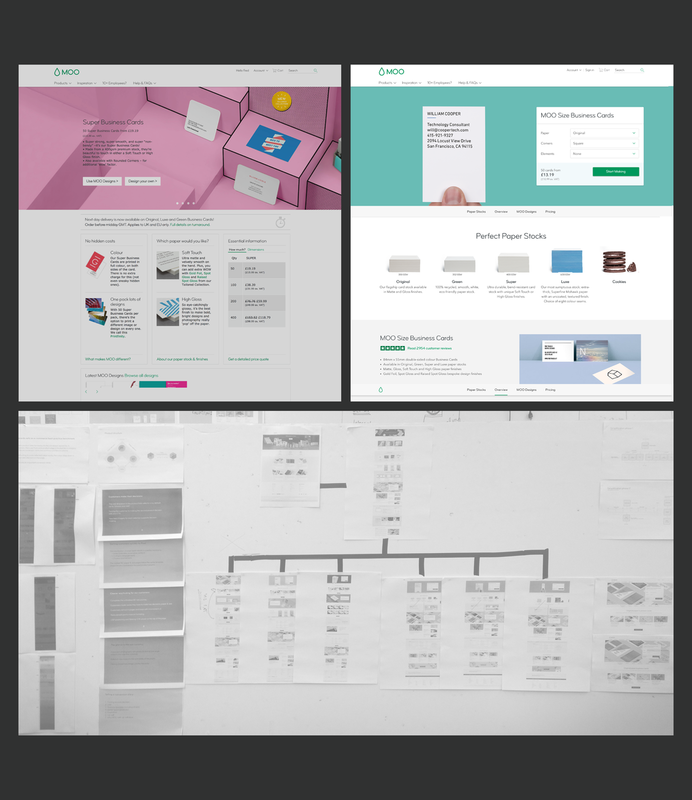 Firstly we felt the experience for choosing 'paper' type or 'size' should use consistent strategy, UX and UI conventions. 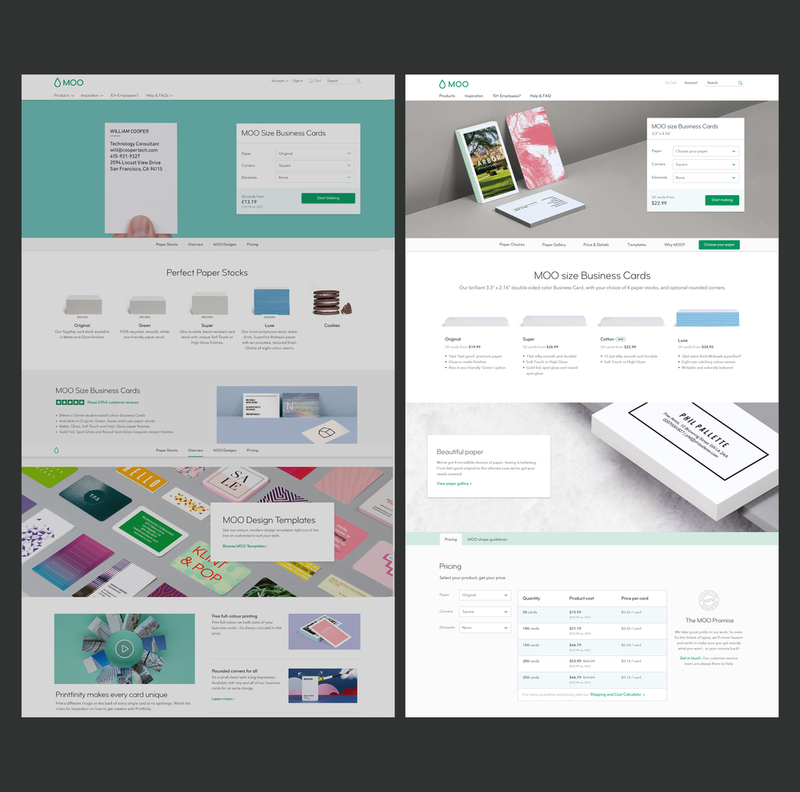 The already migrated 'sizes' pages (right) had prominent commerce elements, price and purchase options which we felt was hugely important to help guide customers into purchasing funnels. Especially with the then busy nature of the MOO.com experience. The task of making 'paper' and 'size' pages consistent had another challenge to overcome. Sales data was tracking a decline in conversion since the business card 'size' pages went live. This endangered not only our approach but the template itself, potentially setting back total migration by months. To address this we used data from a successful newly launched simple (i.e. not a print service) product. This demonstrated that the approach worked, if the purchasing options were given compelling context within close proximity / in the same viewport area. We used heat and click map (left), as well as overall conversion data. Our approach (right) leveraged this successful arrangement. We also needed to address problems with the 'shape' and non migrated 'paper' pages utilising default settings (i.e. 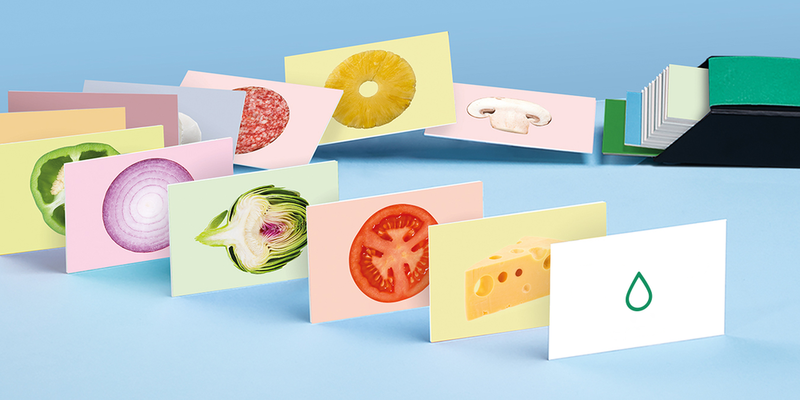 pre-selected to Original paper or MOO sized business cards). This was trapping customers into product tunnels which required restarting the entire print production / design process if they didn't notice the initial selection. This was achieved by removing the default selection and forcing the user into error (below) if they initiated the main CTA without making a selection. The intention being the error would resonate and focus the user's awareness and the memory of their selection.